The farce is strong in the "uproarious salute to science fiction" (The Hollywood Reporter) when Spaceballs: 25th Anniversary Edition blasts off on Blu-ray August 7 from Metro-Goldwyn-Mayer Studios Inc. and Twentieth Century Fox Home Entertainment. Comedy legend Mel Brooks leads an all-star cast of cutups including John Candy (Splash), Rick Moranis (Ghostbusters) and Bill Pullman (Ruthless People). When the evil Dark Helmet (Moranis) attempts to steal all the air from planet Druidia, a determined Druish Princess (Daphne Zuniga), a clueless rogue (Pullman) and a half-man/half-dog creature who's his own best friend (Candy) set out to stop him. But with the forces of darkness closing in on them at ludicrous speed, they'll need the help of a wise imp named Yogurt (Brooks) and the mystical power of "The Schwartz" to bring peace and merchandising rights to the entire galaxy! Twentieth Century Fox Home Entertainment combed the desert to bring fans an all-new featurette for the Spaceballs: 25th Anniversary Edition Blu-ray entitled "Farce Yourself! 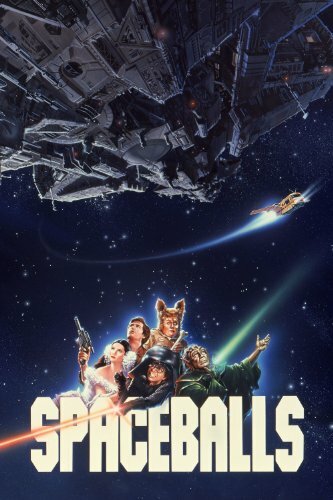 Spaceballs and the Skroobing of Sci-Fi." Mel Brooks takes fans on a guided tour into the making of the SPACEBALLS saga, exploring the film's inspiration, its production, visual effects (including the sizzling creation of "Pizza the Hut"), how the film directly tears down the adventurous (Star Wars), the scary serious (Alien) and even the apocalyptic (Planet of the Apes) in his own uninhibited way and its epic status as Mel Brooks' most successful and beloved fan favorite film. Additional bonus features include commentaries, behind-the-scenes featurettes, still galleries, trailers, film bloopers and more.